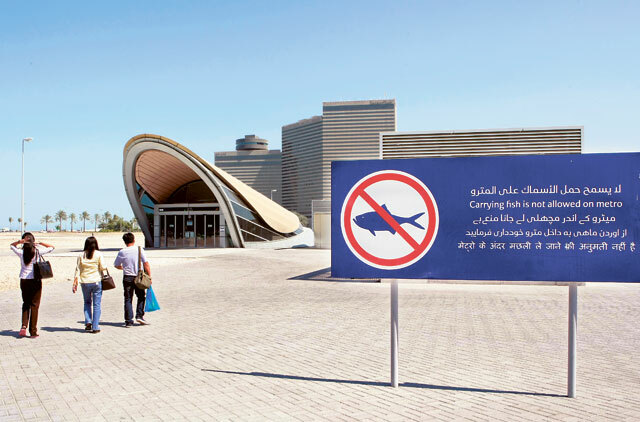 Dubai Commuters are sneaking fish on board Dubai Metro despite fines, XPRESS has learnt. Tactics include putting fish in airtight bags to keep in the smell and concealing the package in handbags, backpacks and oversized money belts that go around the waist. But not everyone gets through — Metro staff zero in on passengers carrying fish in open plastic grocery bags as the odour gives them away. Random checks on fishy travellers at times also uncover the banned cargo. Particularly dicey for both passengers and staff is the Palm Deira station — located right next to the fish market. There is an enormous no-fish sign at the entrance and smaller ones on the doors and inside the station. Still, dozens of risk takers are caught at the station every month, said a staff member showing receipt books filled with "fish carrying" fines. It is believed fish has been banned because of strong odour. "Why did they put a Metro station bang at the fish market if fish aren't allowed on the Metro? I'm annoyed. I came here by Metro and want to buy fish but how do I take the fish back with me?" an Indian fish lover complained. Fish sellers at the market said one alternative was to have the fish fried — for Dh5 a kilo — and eaten on site. Others suggested taking the bus or taxi home. Fresh fish at the Carrefour supermarket next to the Al Ghubaiba Metro station are packed in sealed bags on request. A fish counter employee said the bags have become popular with shoppers heading to the Metro. But his colleague said the bags have always been routine. A Metro cashier at the Al Ghubaiba station said "you could risk it" when XPRESS asked her about the chances of getting on board with fish. "We don't catch so many here, it's more at Palm Deira," the cashier explained. The fines were variously put at Dh110 and Dh210 by cashiers and information booth attendants at Metro stations. They said all stops have no-fish signs, but several regular Metro users said they had never seen one nor heard about the rule. "I haven't heard about it, but it's a good idea. It's bad enough smelling armpits at rush hour, you don't need to add fish to the mix," an Indian passenger said.